Bringing the sky down to earth. 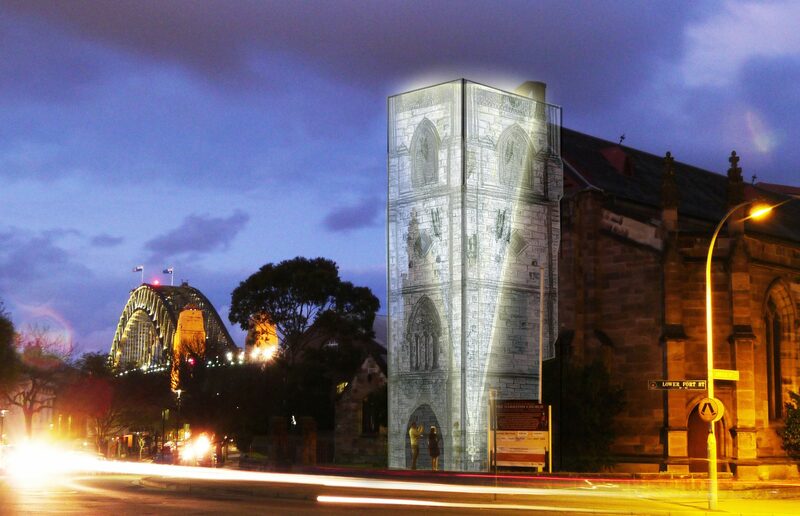 A proposed light installation reinterprets the unbuilt spire of Sydney's historic Garrison Church in an ephemeral architectural work made of fabric, steel cabling, scaffolding and LED lighting. The Garrison Church was originally designed by Henry Ginn, and its spire designed by Edmund Blacket in the 1850s. In this design, the church entry is extended, creating the footprint of the spire and tower as it appears in the original architectural drawings by Blacket. The base of the spire is formed using scaffolding, to be clad in laser cut building wrap printed with a large hand drawn image that shows at 1:1 scale the materiality and articulation of the originally intended design. This spire is lit from within by narrow-beam LED lighting so that its texture and details are highlighted. Instead of rising upwards, however, the reinterpreted spire is inverted, suspended there by a structure of steel cabling. Its effect would be to create a new threshold, an immersive temporary architectural extension that reinterprets the historic potential of the original church design, while restating the intent of the spire – not to mark the skyline but instead to locate the individual within community, to orient the observer to the specifics of place. A musical soundscape was part of the envisaged work. A single musician, or small groups from Sydney Youth Orchestra’s Symphonic Wind Orchestra would stand at the thresholds of the church, to perform music inspired by military and seafaring songs contemporary with the classical and romantic eras. This competition entry for 2016 VIVID Sydney festival was designed in collaboration with the Garrison Church, SYO Wind Orchestra, and East Electrical.